Produced behind closed doors, disposed of discreetly, and hidden by euphemism, bodily waste is something common to all and as natural as breathing, yet we prefer not to talk about it. But we should—even those of us who take care of our business in pristine, sanitary conditions. 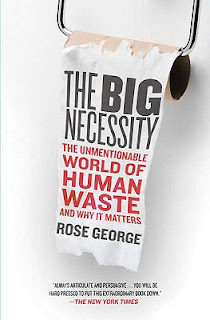 For it’s not only in developing countries that human waste is a major public health threat: population growth is taxing even the most advanced sewage systems, and the disease spread by waste kills more people worldwide every year than any other single cause of death. Even in America, 1.95 million people have no access to an indoor toilet. Yet the subject remains unmentionable. The Big Necessity takes aim at the taboo, revealing everything that matters about how people do—and don’t—deal with their own waste. Moving from the deep underground sewers of Paris, London, and New York—an infrastructure disaster waiting to happen—to an Indian slum where ten toilets are shared by 60,000 people, Rose George stops along the way to explore the potential saviors: China’s five million biogas digesters, which produce energy from waste; the heroes of third world sanitation movements; the inventor of the humble Car Loo; and the U.S. Army’s personal lasers used by soldiers to zap their feces in the field. With razor-sharp wit and crusading urgency, mixing levity with gravity, Rose George has turned the subject we like to avoid into a cause with the most serious of consequences. What a topic! It's one of those hush hush, we don't talk about this in polite company sort of subjects. But it's something that we do, it's a fundamental part of being a human. It's also something that now scares the crap (ha ha) out of me. Not the function, but the aftermath. Where does it all go? In the West we just flush and forget. It turns out that we are in the minority. I learned more than I ever wanted to know about poop. (Dysentery, cholera, open pit latrines, oh my!) But I was fascinated by every word. If you've read this I'd love to know what you thought! As I mentioned in the comments on your previous post, I actually think that this is an important topic for someone who wants to get a better understanding of the world. I do think that it is great that the author mixed humor and seriousness. I might give this one a try. hahaha loved your review, this sounds gross but great! I'm always on the lookout for new non-fiction writers that can tackle these sorts of subjects with humor. This looks promising. I hope you do read this, I'd love to know what you think if you do! It's a great read! Very informative..almost scary!